Each of the 14 Audio-Technica mtu201 deskstand transmitters is fitted with an ES915C12 gooseneck microphone in the boardroom. 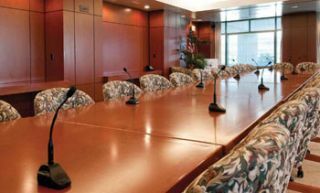 SACRAMENTO, CA—Federal changes to the usable wireless frequency spectrum and patient confidentiality topped the list of challenges when Sacramentobased Associated Sound set about upgrading boardroom communications at Shriners Hospitals for Children in Northern California. The solution lay with Audio-Technica’s SpectraPulse wireless microphone system, which, through implementation of the manufacturer’s Ultra Wideband (UWB) technology, offers data security, avoids any “white space” issues, and provides immunity to local area RF traffic. “We wanted to be able to cover all the bases,” said Wally Clark, president of Associated Sound, a full-service pro audio and video sales and rental company that has served the area for 43 years. Having added wireless microphones to the boardroom 10 years ago, Clark knew that the FCC’s frequency spectrum reallocation to make way for digital television was a concern. Health Insurance Portability and Accountability Act (HIPAA) regulations protect patient privacy and confidentiality. SpectraPulse offers a high level of security—AES 128-bit encryption is also an option—through the implementation of A-T’s proprietary UWB technology, which transmits across a 500 MHz bandwidth within the 6 GHz frequency spectrum. The technology also avoids radio frequency interference issues. “We have a lot of TV stations in Sacramento. This hospital is right across the street from UC Davis Medical Center. Even in the building itself there’s one whole floor of research where I know there are electronic devices being used,” reported Clark. The boardroom, measuring approximately 40 feet wide by 100 feet long, with glass along two sides, hosts monthly hospital board meetings. During the interim it is used for meetings by staff, doctors, visiting VIPs, and even outside groups, according to Clark, a Shriner and former board member. “With the number of important meetings that take place in our hospital boardroom, we cannot compromise on sound quality,” said Robert Tamblyn, chairman of the Board of Governors, Shriners Hospitals for Children, Northern California. The A-T system integrated seamlessly with the old setup. “We were able to put this in and use the existing speakers, amplification, and mixer,” commented Clark.